Site-finished; (3/4" solid flooring. Installed, sanded, finished onsite). the best looking and performing floor to have. No "V" grooves to catch dirt or liquids. A beautiful one-solid piece look that is easiest to maintain. Pre-finished; (3/4" Solid flooring, sanded and sealed at the mill). With "V" grooves or overwood (small ridges). It's easy to spot a pre-finished floor. Easier to install but a poorer investment over time. Engineered Plank; (1/2" - 3/4" thick - real wood flooring laminated on plywood). Usually used with floating installation over concrete slab or radiant heat. Performs very well with foam rubber pad underneath. Australian Cypress, German Beech, Brazilian Cherry, Peruvian Walnut, African Padauk, Heart Pine, Moabi, Cumaru (Brazilian Teak), Sucapira (Brazilian Walnut), Bamboo, Tamarindo, Tatajuba, Wenge, Purpleheart, Mahogany. Mostly domestic brands (25-30yr manufacturer's warranty on finish). Some with stains, to help provide the look and color you want. Both domestic and exotic species, some natural/some stained. Come Take a Look - - A great way to get hardwood floors over concrete or radiant heat! 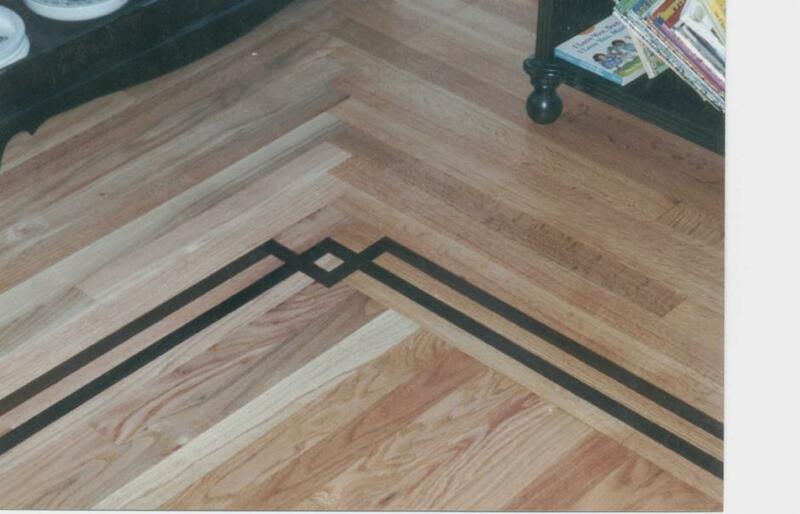 From Medallions to Inlays; From Simple to Dramatic, From Herringbone & Parquet to Borders and Custom Work Henderson Hardwoods Does It All! 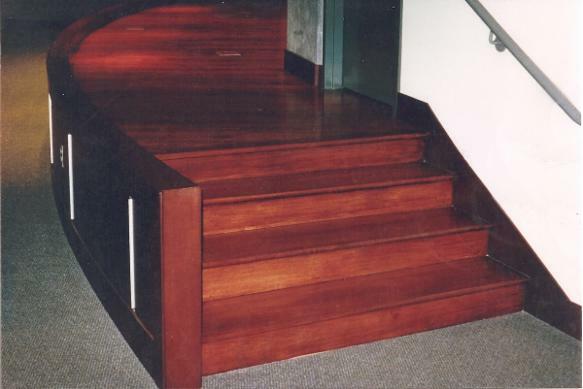 We also install or refinish Staircases (treads, risers, landings and skirtboards), Trim Packages (base, door and window casings) and custom wood vents to enhance your floors. Water-based finished have come a long way with the introduction of Glitsa's new "Max" finish. It equals the strength and durability of traditional Swedish finish, but with a lighter color tone; friendlier to our ecology, though a bit more expensive. Swedish finish doesn't show scratches as much as water-based finish. Swedish finish brings out a deeper, richer color in woods. A water-based finish is usually lighter in color. Swedish finish costs less than its water based counterpart. Water-based finishes will not patina (darken) nearly as much as Swedish finish when exposed to sunlight. Therefore, if you have lots of windows and do not want the floor to patina over time, a water-based product may be what you are looking for. There are less VOCs or Volatile Organic Compounds in a water-based product. There is less "off-gasing" and takes less time to cure than a Swedish finish. A water-based product is less smelly than the Swedish finish and is easier on allergy sufferers.